As mandated by Government, now Public Sector Undertaking (PSU) recruit engineers through Graduate Aptitude Test in Engineering (GATE) only. PSU recruitment Graduate Engineers as Graduate Engineers Trainees (GET), Officers, Management Trainees at various level and in various disciplines/ subjects etc. Therefore, as every year, this year (2019) also Public Sector Undertaking (PSU) companies are in the process of recruiting the suitable candidates for their Engineering Departments through Graduate Aptitude Test in Engineering (GATE) 2019 which is being conducted by Indian Institute of Technology (IIT), Madras this year. Graduate Aptitude Test in Engineering (GATE) is an examination conducted jointly by the Indian Institute of Science (IISc), Bangalore and the seven Indian Institutes of Technology (at Bombay, Delhi, Guwahati, Kanpur, Kharagpur, Madras and Roorkee) on behalf of the National Coordination Board (NCB)-GATE, Department of Higher Education, Ministry of Human Resource Development (MHRD), Government of India. The Organizing Institute for GATE 2019 is Indian Institute of Technology Madras (IITM). 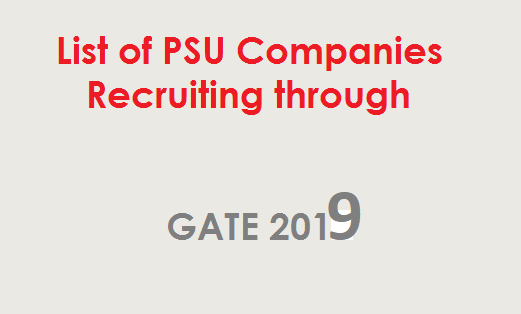 Public Sector Undertakings (PSUs) have been using the GATE score in their recruitment process. GATE 2019 will be conducted on 24 subjects and as ONLINE Computer Based Test (CBT). The online examination paper will contain some questions for which numerical answers must be keyed in by the candidate using the virtual keypad. Rest of the questions will be of Multiple Choice Question (MCQ) type. The Candidates will use ONLY an on-screen virtual calculator provided for the examination. The Examination for GATE 2019 will be conducted on 2nd, 3rd, 9th, 10th February 2019. Application for the GATE 2018 Examination has to be submitted online only from 01/09/2018 to 21/09/2018 which is now extended up to 01/10/2018. The application fee for GATE 2019 is Rs. 1500/- (Rs. 750/- for Female/SC/ST/PWD candidates) and for extended period fee is Rs. 2000/- (Rs. 1250/- for Female/SC/ST/PWD candidates) to be paid online. For more details about GATE 2019, you can follow link given below: GATE 2019 Examination Notification, Apply Online. Here is a list of PSU companies who are supposed to accept GATE 2019 score for the recruitment of engineer/ management trainee. This list is not exclusive.